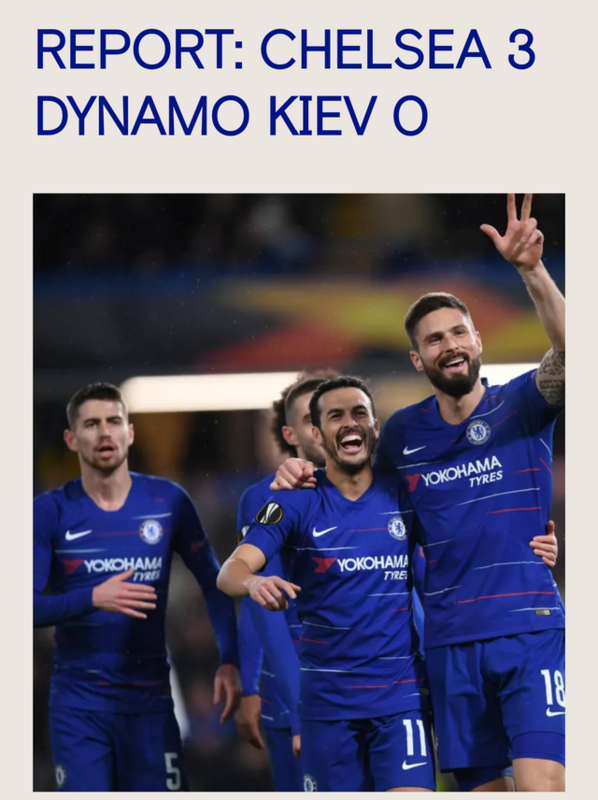 CHELSEA FC won DYNAMO KIEV 3-0 at Stamford bridge at the first leg of Europa league, giving them an edge in the competition. The match shows that Chelsea can deploy a formidable second eleven which is not yet top notch yet but can help out in other for some key players to relax. Goals from Pedro,william and Hodson-Odoi did the wonders. Tho Pedro missed gave away many chances which would have made him scored hattrick which did not went down well with some Chelsea fans as they expect chelsea forwards to be clinical in their finishing. David Liuz made so much sensation long passes which would have been a tv advert if the receivers had made good chances of it. Christensen is gradually showing Chelsea coach that he is up to the task to be a starting defender. His calmness and timeness really showed up in the game. Jorginho gradually adjusting to what have been expected from him. Loftus Cheek and Hodson-Odoi are trully ready and deserves starting spot and they are Chelsea Future. Good game from the blues boys. Wolves up next.